Ahn Chang-ho in Los Angeles, California. 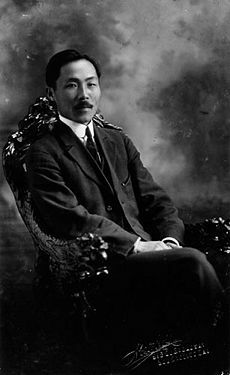 Ahn Chang Ho, or An Chang-ho, pen name Dosan, (November 9, 1878 – March 10, 1938) was a Korean independence activist and one of the early leaders of the Korean-American immigrant community in the United States. He established the Young Korean Academy (Heungsadan; 흥사단; 興士團) and was a key member in the founding of the Provisional Government of the Republic of Korea (대한민국임시정부; 大韓民國臨時政府) in Shanghai, China. Ahn is one of two men believed to have written the lyrics of the Aegukga, the South Korean national anthem. Many consider Ahn Chang-ho to be one of the key moral and philosophical leaders of Korea during the twentieth century. In the turmoil immediately before and during the Japanese occupation of Korea, he called for the moral and spiritual renewal of the Korean people through education as one of the important components in their struggle for independence. Ahn Chang-ho (안창호) was born in an island village on November 9, 1878 (lunar calendar) in Kangseo, South Pyeongan province, in present-day North Korea. He was the third son born to Ahn Heung-guk (안흥국, 安興國), a village teacher. Ahn’s father and grandfather were originally from Dongchon of Pyungyang county, where there was an Ahn family cemetery and a shrine for Moonsunggong, Ahn Yoo, a famous early family ancestor. Ahn Chang-ho was educated in classical Chinese studies at a local village school and then studied Confucianism under Kim Hyun-Jin at Shimjungli, Dongjin town, Kang-su county. In 1895, Ahn moved to Seoul where he attended Gusae Hakdang (Save the World School), a missionary-sponsored school run by the Americans, Rev. F. S. Miller and Rev. Horace Underwood. A 1937 article in Choson Ilbo, stated that Ahn studied English under Underwood himself and eventually converted to Christianity, receiving baptism in the Presbyterian church. At Gusae Hakdang, Ahn met Pil Dae-eun, an older student from Anak, Hwanghae province, who was to have great influence upon Ahn's forming ideas of nationalism and patriotism. Ahn in turn influenced Pil Dae-eun to convert to Christianity with him. After Pil’s death, Ahn visited his grave in the Christian cemetery at Sojangdae in western P'yŏngyang. In 1895, Japan defeated China and drove the Chinese from the Korean Peninsula. Pro-Japanese and pro-Russian factions fought to gain control of the Korean government. When Queen Min favored closer ties to Russia, Japanese troops assassinated Queen Min in order to weaken Russian power in Korea. Ahn joined the Independence Association at age 20 (1897) and became increasingly involved in the nationalist movement. Between 1898 and 1901, Ahn traveled throughout the area around his village giving speeches promoting the Independence Association. Ahn also organized the P'yŏngyang chapter of the Association and started the Cheomjin elementary school, where he himself taught along with Choi Gwang-Ok and Lee Suk-Won. Cheomjin School was the first co-ed school in the nation. The main philosophy taught at Cheomjin school was “steady progress throughout one's life, rather than fast drastic change.” Ahn staunchly believed that true independence and autonomy for Korea would only come through education. Feeling that advanced education, not available in Korea, was the next important step he could take toward supporting Korean independence, in 1899, Ahn returned to Seoul and prepared for studies in the United States. At Ahn’s insistence, his fiancée, Lee Hye-ryeon (1885-1973) enrolled at the Presbyterian Chongsin Girl’s School. She was the daughter of Ahn’s teacher in P'yŏngyang who, as a minister and teacher, encouraged her education in a time when very few girls in Korea had the opportunity to go to school. Ahn Chang Ho and Lee Hye-ryeon (her Christian name was Helen) were married in 1902. They applied for and were issued passports, among the very limited number of passports authorized by Emperor Gojong before the Japanese took control of Korea in 1905. Ahn Chang Ho and his wife were the first Korean couple to immigrate to America. As soon as they could, they departed for America by ship from Incheon. On the way, their ship docked at Tokyo and Honolulu. Ahn was so impressed by the Hawaiian island mountains rising from the sea, that he took the pen name Dosan, meaning “island mountain" or "mountain of knowledge.” From Hawaii the Ahns sailed on to Seattle, finally settling in San Francisco. There, the Ahns met Dr. Drew, an examining physician. Ahn went to his home in search of a job and Dr. Drew employed him as the caretaker of his home. At the age of 24, Ahn actually enrolled in an American elementary school in order to learn English and to study the American school system. While living in California, Ahn witnessed two traditionally dressed Korean men fighting in the streets over ginseng sales territory. Ahn was apparently upset by this lack of civility among his overseas countrymen, and he began to invest time into reforming the local Korean diaspora, rising to become one of the first leaders of the Korean-American community. He founded the Chinmokhoe Friendship Society in 1903, the first Korean organization in the continental United States. Borrowing $1,500, Ahn organized Korean labor in the citrus groves, inspiring them with statements such as, "To pick even one orange with sincerity in an American orchard will make a contribution to our country." He improved their productivity to the point that farmers preferred hiring Korean workers over Japanese. In 1906, he established the Mutual Assistance Society (MAS). MAS would eventually merge with the United Korean Society in Hawaii to become the Korean National Association (대한인국민회; 大韓人國民會), the official agent of Koreans in the United States until the end of World War II. Ahn Chang Ho and other members of the Provisional Government of the Republic of Korea, Shanghai, China, October 11, 1919. Front row, from left: Shin Ik-hoe, Ahn Chang Ho, Hyun Sun. Back Row: Kim Cheol, Yun Hyeon-jin, Choi Chang-sik, Lee, Chun-suk. In 1908, the Constitution of the Korean National Association was written, based upon democratic principles. In 1911, Ahn traveled through Russia and China where he gathered Koreans living there and established branches of the Independence Movement in Vladivostok and Manchuria. 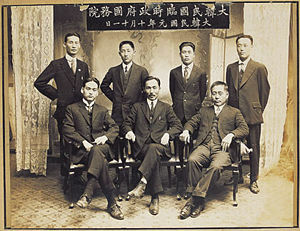 Back in the United States, Ahn established several Korean independence groups. One of them, Young Korean Academy (Heungsadan), still exists in both the United States and Korea. One of the functions of the American chapter is maintaining the archives of the literary legacy left by Ahn. The Ahn’s American home became a way station for Koreans entering the United States and an important gathering place for Korean Americans in the independence movement. Helen worked various domestic jobs to support their family and she was always able to provide rice and kimchi to the numerous visitors, and sometimes salted herring from the Jewish section of town. Helen also financially helped support her husband when he was away from home. With five children to raise by herself, her burden was unrelenting. In March 1919, the Korean Independence Movement became extremely active. In anticipation of this activity, Ahn traveled to China and set up a provisional government in Shanghai. Appointed premier, Ahn held the post until 1921. After one last visit to the United States, Ahn, who had traveled to China, Russia, Europe, and Mexico, campaigning for Korean Independence, continued his anti-Japanese activities among Koreans in Manchuria and in Korea. He was arrested and released by the Japanese in 1927. After the 1932 Yun Pong-gil bombing incident in Honggu Park that killed several Japanese officers, Ahn was again arrested by the Japanese and served nearly four years in prison in Daejeon. After his release in 1935, Ahn was released and again traveled through Korea, rallying support for Korean independence. Japanese police followed his every move, and finally Ahn retreated to Seongtae villa on Mount Daebo near his hometown. Shortly before the Sino-Japanese war began, Ahn was again arrested with others who held membership in Suyang tongju-hoe, a Korean branch of Heungsadan, but due to severe illness, he was released on bail and transferred to the Kyeongseong University hospital where he died on March 10, 1938, at the age of 59. No, I cannot. When I eat, I eat for Korean independence. When I sleep, I sleep for Korean independence. This will not change as long as I live. As all the Korean people want their independence, Korean independence will become reality; as world opinion favors Korean independence, it will become reality; and as Heaven orders Korean independence, Korea will surely become independent. I don't want to see Japan perish. Rather I want to see Japan become a good nation. Infringing upon Korea, your neighbor will never prove profitable to you. Japan will profit by having 30 million Koreans as her friendly neighbors and not by annexing 30 million spiteful people into her nation. Therefore, to assert Korean independence is tantamount to desiring peace in East Asia and the well-being of Japan. 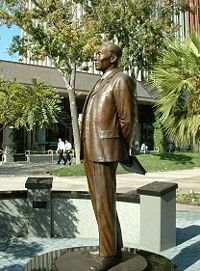 Statue of Ahn Chang-ho in Riverside, California. Ahn dedicated his life to working for his native Korea, and as a result, spent a great deal of time away from his wife and five children. Surely it was with mixed emotions that he watched his family taking root in the United States. He would have liked to keep his family together in Korea, but was not satisfied with the condition of the country while it was under the control of Japan, and chose to return to Korea alone to continue his work for Korean independence, leaving his wife and children in the United States. Susan Ahn Cuddy received a Woman of the Year Award in California in 2003 and The American Courage Award from the Asian American Justice Center in Washington, DC in 2006. In 2008, Susan Ahn Cuddy spoke to a crowd of 8,000 on UCLA campus, and supported Barak Obama as a candidate for President of the United States. In Seoul, Ahn has been honored by the construction of a memorial park (called 'Dosan Park'; Korean: 도산공원) and hall built in his honor in Gangnam-gu, and in addition, one of the main boulevards in the Gangnam-gu section of Seoul has been named Dosandaero after him. Another memorial was built to honor him in downtown Riverside, California. Ahn's family home on 36th Place in Los Angeles has been restored by the University of Southern California, on whose campus it sits (albeit in a different location). The City of Los Angeles has also declared the nearby intersection of Jefferson Boulevard and Van Buren Place to be "Dosan Ahn Chang Ho Square" in his honor . A main freeway interchange in downtown Los Angeles where the 10 Freeway and 110 Freeway meet is named after Dosan Ahn Chang Ho. The Taekwondo form of 24 movements Do-San was named after him. The International TaeKwon-Do Association, requires mastery of the Do-San form for advancement from 8th Gup Yellow Belt to 7th Gup Yellow Belt with Green Stripe. ↑ 1.0 1.1 Arthur Leslie Gardner, The Korean nationalist movement and An Cháng-ho: advocate of gradualism. (Thesis—University of Hawaii, 1979, OCLC 34627397). ↑ First Journey to America 1902, dosan.org. Retrieved October 27, 2016. ↑ 3.0 3.1 3.2 Pyong-Uk Ahn, [www.dosan.org/images/Dosan.doc Dosan: The man and his thought] Retrieved October 27, 2016. ↑ John H. Kim, Esq. (ed. ), "A Brief History of Korean Americans" National Association of Korean Americans, 2003. Retrieved October 27, 2016. All links retrieved October 27, 2016. History of "Ahn Chang Ho"
This page was last modified on 27 October 2016, at 21:07.